Michael Bloomberg, the mayor of New York City, presided over the marriage of two of his aides yesterday. He officiated the wedding ceremony of John Feinblatt, his chief policy advisor, and Jonathan Mintz, the city’s commissioner for consumer affairs, who have been together for 14 years. 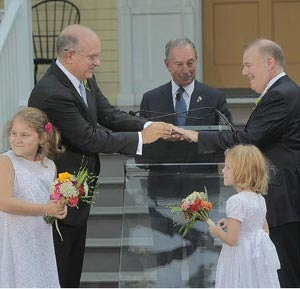 The couple married at Gracie Mansion with their two young daughters, Maeve and Georgia. Mr Bloomberg, who joked that the couple better not be late for work the next day, addressed the couple in front of around 150 guests. He said: “It’s taken New York State a long time to recognise what the two of you must have known instinctively: that two people who want to be together, and raise a family together, and spend the rest of their lives together – have a relationship and a beautiful family – that, in every way, deserves to be recognised and commemorated equally under the eye of the law. “Today, we are doing that. And today, surrounded by family and friends, you are making history. Not only for the obvious reasons. You are making another kind of history. Equally important. You are writing the next chapter in your personal history and that of your family. By going through this ceremony, you are changing the future – for yourself, and for generations to follow. Just over 800 gay weddings were held in New York City yesterday as the state celebrate the first day of legalised gay marriage.